Subtitle: Great Damage Is Being Caused By Things We Cannot See! Tiny subterranean termites are voracious cellulose eating and daylight avoiding pests that are literally causing billions of dollars in property damage around the world. One variety, known as the "Formosan" termite (apparently indigenous to the island of Taiwan--formerly known as Formosa--and introduced accidentally into the Southern US through the port of New Orleans) has practically devoured parts of Louisiana and is now spreading northward looking for more wood to consume! They are virtually impossible to control with any EPA-approved pesticide and this has caused many pest control companies to put a disclaimer in their "bonds" refusing to cover damage caused by that particular insect. They cannot tolerate light, preferring to do their insidious work in complete darkness. If workers chew through to the outside of a piece of wood and light enters, they will fill in the hole with dirt brought from their nesting area in the ground. They also use dirt to build tunnels up the foundations and support pillars of wood frame buildings so they can pass back and forth in darkness. This often results in damage which goes totally unnoticed until the weight of the wooden structure causes hollowed-out sections to collapse. The exceptions are those in which the dirt tunnels are found by inspecting the building's foundation or by probing the wood with a sharp "ice-pick" type instrument to prevent extensive damage. "For we wrestle not against flesh and blood, but against principalities, against powers, against the rulers of the darkness of this world, against spiritual wickedness in high places" Ephes. 6:12 (KJV). "Be ye not unequally yoked together with unbelievers: for what fellowship hath righteousness with unrighteousness? and what communion hath light with darkness?" 2 Cor. 6:14 (KJV). "This then is the message which we have heard of him, and declare unto you, that God is light, and in him is no darkness at all. If we say that we have fellowship with him, and walk in darkness, we lie, and do not the truth"
"And have no fellowship with the unfruitful works of darkness, but rather reprove them" Ephes. 5:11 (KJV, emphasis mine). What does "reprove" mean in this particular verse? According to W.E. Vine's Expository Dictionary of New Testament Words, the Greek word (elencho) translated "reprove" means, "...to convict, rebuke, reprove, is translated reprove in Luke 3:19; John 3:20, R.V. marg., "convicted"; the real meaning here is "exposed" (A.V. marg. "discovered"); Eph.5:11, 13, where to expose is again the significance......" (page 283, emphasis mine). "Take no part in and have no fellowship with the fruitless deeds and enterprises of darkness, but instead [let your lives be so in contrast as to] expose and reprove and convict them." (emphasis mine). The Strongest Strong's Exhaustive Concordance of the Bible (copyright 2001) says the Greek word elencho means: "to expose; to rebuke, refute, show fault; to convince, convict." (page 1495, number 1651, emphasis mine). "I charge thee therefore before God, and the Lord Jesus Christ, who shall judge the quick and the dead at his appearing and his kingdom;  Preach the word; be instant in season, out of season; reprove, rebuke, exhort with all longsuffering and doctrine" (KJV, emphasis mine). The English dictionary definition of "reprove" is to rebuke, but I believe the Holy Spirit shows us in the verse above [2 Tim.4:2] that the word reprove (translated from Gk. elencho) is primarily intended to carry the meaning of "expose" (as per W.E.Vine's explanation) , because "rebuke" (Gk. epitimao--where the unambigious meaning is to censure, or rebuke) is the very next word in the text. To insist upon any of the other acceptable definitions of elencho in this case would essentially be redundant with that of epitimao. And we believe the generally accepted definition of "rebuke" for elencho, has contributed to a widespread lack of emphasis by preachers upon the "unfruitful works of darkness." "Lest Satan should get an advantage of us: for we are not ignorant of his devices" 2 Cor. 2:11 (KJV, emphasis mine). Ignorance of "the dark side" is pandemic among the shepherds and because of it, demonic termites continue to gnaw away the framework of Christendom. It is a tragedy of cosmic proportions--but apparently inevitable--that the damage will not be dealt with before the walls fall under their own weight. The apostasy ("falling away") of 2 Thessalonians 2:3 is on the horizon and the reasons for the hollowed-out timbers is obvious to only a few because the majority do not recognize the demonic dirt that is keeping the light out. Teaching Christian soldiers to avoid sin without giving them sufficient insight into the tactics of the enemy is like sending troops into battle without any prior knowledge of land mines, ambushes, or other dirty tricks designed to maim and kill the unwary. For us to to try to walk by sight through the darkness of this world is to be oblivious to the presence of a vastly superior enemy force and a sure recipe for spiritual disaster. But if we are thoroughly equipped to recognize danger and are skillful in handling the most potent weapon ever disclosed to mankind--the Word of God--we can be victors and not victims. "For the time [has arrived] for judgment to begin with the household of God; and if it begins with us, what will [be] the end of those who do not respect or believe or obey the good news (the Gospel) of God?" 1 Peter 4:17 (Parallel Bible, KJV/Amplified Bible commentary). The judgment of God upon the sins of His children is that of a loving Father and as we learn from Hebrews 12:6, He chastens every son whom He receives. The household of God is being weakened by demonic "termites" working in our midst and we should make every effort to minimize chastening by exposing them and cleaning up the damage. But at the same time we must bear in mind that this will inevitably result in persecution by those who are unbelievers. Truly living for Jesus Christ and taking up our crosses daily will cost us dearly and I feel this fact has played a major role in the lack of clear teaching on the subject before us. It is a relatively easy thing for pastors to emphasize evangelization of the lost and "building churches," but it is another thing entirely to "reprove, rebuke, and exhort with all longsuffering and doctrine." To expose the unfruitful works of darkness requires a degree of knowledge that is only gained by persistent study and paying attention to what is taking place around us. Ignorant generals are ultimately responsible for the deaths of those who follow their orders and pastors who refuse to face this issue will have to give an account to the Lord. This is truly a sad day in which we live because it is obvious the majority of professing Christians cannot perceive the apostasy among those posing as great leaders of the faith. "Angels of light" are raking in billions of dollars and living high on the hog because of the spiritual blindness of the masses. 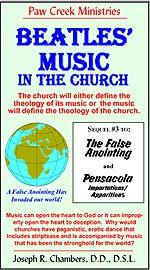 The nations of the world are following an occult agenda--analagous to our example of the dirt tunnels of termites--which remains hidden only because preachers are too preoccupied to look for themselves or listen to the few who are trying to get their attention. The details of this elaborate plan were exposed to the light of day many years ago and are now being discussed openly among those following the dark path of occult gnosticism. But only those who make the effort to inspect "the unfruitful works of darkness" will recognize the damage being done and take steps to expose it. "Behold, I send you forth as sheep in the midst of wolves: be ye therefore wise as serpents, and harmless as doves. Matthew 10:16 (KJV). To preserve life in the midst of wolves one must exercise wisdom by avoiding unnecessary confrontation. Our mandate from God is not to oppose evil through physical means ("...resist not evil...," Matt.5:39), but to be aware of what it entails, avoid it ourselves, and teach other believers to do so. The specific illustration here of being "wise as serpents" has an occult connotation that only one who is aware of such can recognize. Hidden, or occult, wisdom--gnosticism--is central to the tenets of the dark side and universally expressed through the symbol of Satan--the serpent. So this is an exhortation from the Lord to His disciples that they be as wise as the wolves! And that is patently impossible if we insist upon remaining ignorant of what the enemy believes and practices. To be forewarned is to be forearmed. Deception is descending upon humanity like an impenetrable fog and only those who know the truth will be able to navagate.